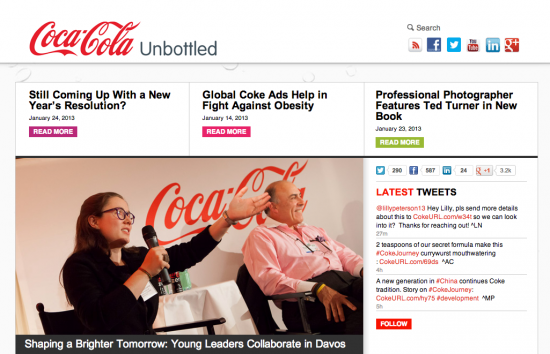 Coca-Cola is just one of the companies betting on content in the future. Everywhere you look in the online world you’ll see company blogs. Some are good. Some have been abandoned and others are thriving. The ones that are thriving are the ones that inspire others to follow and create business blogs of their own. If you’re thinking of creating a company blog it’s good to find inspiration from others. Innovation has always come from taking something that exists and finding ways to make it better. Remember that blogging alone is not a business model. A combination of a great product and a great company along with a good blogging strategy can lead to great success. Here are 15 good company blogs to use for your own inspiration. Bidsketch is a proposal software. Freelancers and businesses use the service to easily and more effectively serve proposals to prospective clients. The service seems to be really taking off and part of the strategy now is to provide incredibly useful tips for potential customers. The blog is highly focused and highly useful. You can only expect great things from this company blog in the future. Evernote has been the recent darling of the Valley. People are really liking the service this company is offering and it appears to be getting even better. The company blog has a few different focuses like tips and stories, but the overall goal is to increase customer acquisition, which is key to growing a profitable business. SEOmoz has been like a rocket ship the last couple years. The SEO company has gone away from consulting and into the software space. They now service tens of thousands of companies and SEO consultants. It’s an amazing transformation and part of the entire SEOmoz strategy is the blogging strategy that’s been in place since the beginning in 2004. SEOmoz even has a UGC blog called YOUmoz. It’s another great strategy. This is the darling of our own blog here at GBW. This blog along with HubSpot is mentioned the most as a favorite blog prospective clients. People love the KISSmetrics blog and it really seems like it’s a big part of the business model for the company, which always should be the goal of a business blog. They do great things as far as analysis and tips for businesses in a variety of industries. We need to include Crazy Egg because of their relation with KISSmetrics. It’s a great company that provides a useful tool for online businesses and the blog is already becoming one of the most popular just like the KISSmetrics blog has become in the last couple years. Target is looking to make content part of its customer acquisition strategy. they have a very unique design for their blog, but it doesn’t stop there. The content is interesting and helpful. The posts are very personal and usually interesting. It makes the company human and approachable. The insurance industry is incredibly competitive. Farmers Insurance doesn’t call it a blog, but they do have a collection of great information that includes articles to help people with big purchases in life. It’s a great example of how business blogging can work to attract new interest and earn trust. How about one of the biggest companies in the world writing useful blog posts. It’s probably not a huge part of the company’s successful, but Sony is blogging for some reason and they’re doing it well. I’m a big fan of golf. Callaway has been a huge name since they introduced the Big Bertha driver back in the ’90s. Today they’re still one of the biggest names in golf and it’s partly because they know what customers want. The company focuses on products and on their company blog they focus on the stories of the pros and amateurs using the clubs to do great things. Wells Fargo has been one of the most successful companies of the last 30-some years. They’ve been acquiring customers at a great rate and it’s no surprise that they also have a great company blog. There is lots of advice for business owners and for those looking for financial advice. Here’s another company that many thought might be irrelevant in a few years. Xerox is putting effort into creating blog posts that matter to people and it seems there is some interest. Talk about a company doing great things in the customer acquisition space. Red Bull sponsored the record breaking sky dive last year and they’re really investing in becoming a media company. They have multiple blogs covering lots of crazy things. It’s a totally unique strategy especially for drink company. The GPS world has been under a bit of pressure recently. Phones can now do what a GPS did just a few years ago. It’s good to see that Garmin is still around and doing well. They also appear to have a great blogging strategy. They write about what’s happening at the company including the news with new products. The only time I’ve seen anything about Fandango it was while I was sitting in a theater. It turns out the company has a great blog. They even take recent events in the movie industry and provide insight and coverage. That’s something Fandango’s ideal readers care about. It’s really a simple concept when it comes to business blog. Write about the things that interest your idea readers. Big companies are blogging too. In fact, Coca-Cola is investing big time in content in the next 5+ years. They’re writing about all the things people care about and it’s a far reaching campaign including insight on their own company blog. For more good company blogs check out The Big List of Companies That Blog. These good company blogs have a lot in common. Many of them use similar formats for posts. They are all successful companies first with focus on getting new customers. Blogging happens to be a part of their overall business model that includes great products. But the important thing to remember is each of these companies is different. They do business differently and they blog differently even if it’s just a slight difference. Every blog has its own voice. Make sure you tell your story with your company blog. That’s how you can stand out and find your audience.